As a pet owner, your animal’s well-being and health is your main concern. Nobody wants to make an emergency trip to the vet because their dog or cat is sick or hurt. At 911 Vets, we take your pet’s health as seriously as if they were our own, which is why our 24 hour vet offers services that you can’t get from traditional vet clinics. At a regular veterinary clinic, you have to go to them, but with our mobile vet clinic, we come to you. Whether you have an emergency or you just need a routine checkup, we offer all the services of a traditional clinic, right in your home. Contact us today to schedule an appointment or learn more about the different services we offer by exploring our website. In a previous blog, we discussed common diseases that can be found in your dog. 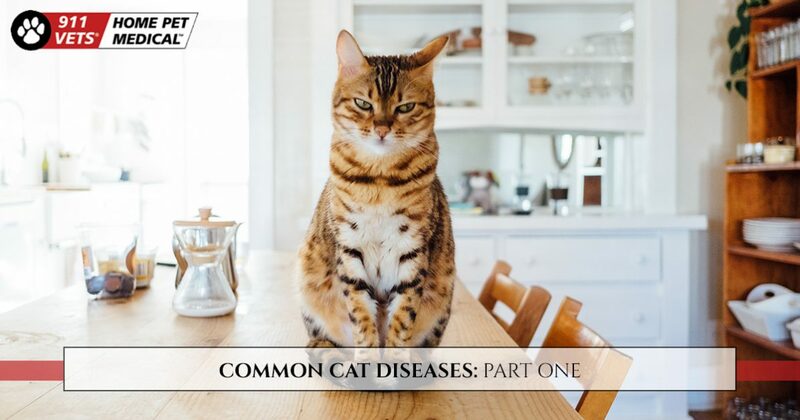 Today, we will discuss common diseases that can affect your cat so you can be better prepared to recognize the symptoms before it’s too late. Continue reading for part one of this multi-part series. These are just a few of the symptoms associated with a URI, If you notice a change in your cat’s behavior coupled with any of these symptoms, be sure to schedule an appointment with 911 Vets. As we mentioned above, diabetes is a very complex disease and should be researched thoroughly. If you suspect your cat has diabetes, contact 911 Vets immediately. With our mobile vet clinic we can come to your home and assess your cat and give you all the necessary information. Contact us today. During the Spring, you may enjoy opening the windows to let in some fresh air. However, if you have windows without any screens, this poses a real threat to your cat. In an attempt to get a better whiff of all the smells from outside, your kitty may jump up on sill, but if he or she has too much momentum and there isn’t a screen to catch them, your cat could end up falling. You cat’s claws will allow them to grip to things like tree bark or carpet, but window sills, concrete, and brick are too smooth for your cat to grip. If your cat does fall from a window, or off your terrace, they could suffer injuries such as punctured lungs, shattered jaws, broken bones and more. To prevent high-rise syndrome, it’s important to install secure screens on all your windows, and check any previously installed screens to make sure it isn’t easy for your cat to push them open. If your cat falls out of a window, there is a 90 percent chance they will survive if you call 911 Vets immediately. 911 Vets mobile vet clinic provides all the services of your traditional veterinary clinic, right in your home. Call us for more information about our services, or schedule an appointment with 911 Vets today.